In 2003, I was commissioned to create copies of Neolithic pottery for the Museums of Dispilio and Augi in Kastoria,Greece . The characteristic fine burnish; minimal, fine forms and strong aesthetics applied to items of everyday use in Neolithic times have influenced and enriched my work. I am motivated by a need to continue the creative conversation with the past and to introduce the art of the Neolithic potters to the present. I also enjoy learning about nature, identifying species of mushrooms, herbs and general forest life. 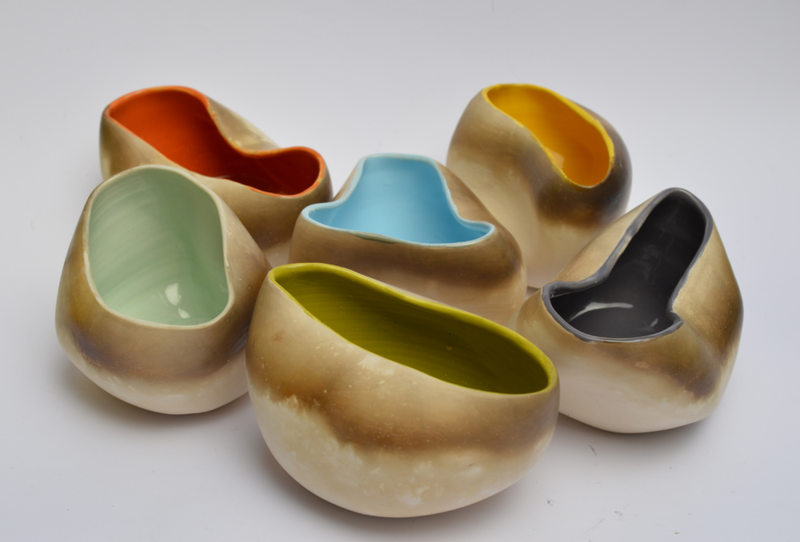 These ancient pottery methods combined with organic shapes, forms and colours create my contemporary pieces. To achieve the smooth, unglazed and smoked-fired outer surface, I begin by shaping each ceramic piece into a unique organic form. I then spend time refining the shape and using stone to burnish the outside. The glazed inner surfaces are enriched with carefully selected warm colours, making modern, calming and functional pieces. I believe the opposite qualities of these two surfaces create a sense of wholeness and flow. Warm feelings rise when you are holding a small, floating lake cup between your palms, and a bond is formed between you and the ceramic form. There are also playful intentions in my work, which are expressed with the colour combinations, oddly balanced shapes and a grotesque, circus atmosphere. I like to give people a smile when they use the ceramics, creating a relationship of familiarity and gratitude with the object. The works illustrated below are intended to give you a taste of what the gallery has to offer, please email us on info@cambridgegallery.co.uk or call us on 01223 324222 to find out which pieces are currently available. Prices range from £18 - £200. 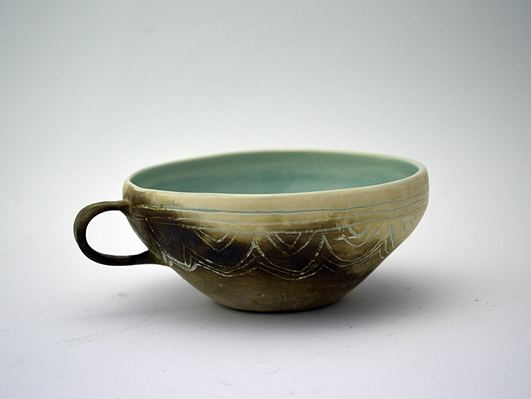 cup: 6 x 9 cm approx. tile: 9.5 x 8 cm approx. 6 x 15 cm approx. 13 x 8 cm approx.